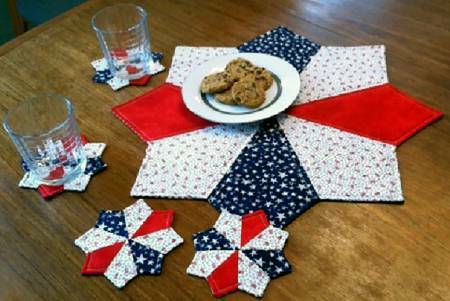 Coaster 5in, Topper 20in.Uses Creative Grids CGRKA6.Projects Time: -2 Hour.Fabric Type: Fat Quarter Friendly.Project Type: Home. Adele's tips: Starch fabrics to prevent stretching. Lay all shapes out as you put them together to prevent sewing the wrong parts together. Lay out the fusible fleece fusible side up then place all sewn "tops" in place with just enough room to trim apart. Then using your BoNash ironing mat press with cotton heat and steam. Cool for a minute then cut out shapes. Piece backs to save fabric and make the backs more interesting.